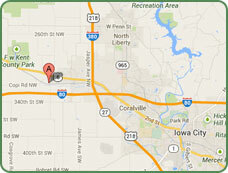 Welcome to Half Moon Kennels serving the Iowa City, Coralville and North Liberty area! Discover the wonders of canine socialization. Iowa City, Coralville and North Liberty area's premiere dog boarding and doggie daycare facility. At HalfMoon Kennels we offer a place where dogs can socialize, have fun, get plenty of exercise or just hang out with the pack. We have a large indoor play area with Coolaroo beds for relaxing. We have a one acre grass area for outdoor playing with plenty of shade trees for relaxing. Your dogs safety and well-being is our highest priority. We treat our dogs like children they will be pulling you through the door to come play! Over 3 acres fenced-in outdoor playground. 7,000 sq. ft. of climate controlled indoor play area. All dogs must be spayed or neutered and up-to-date on their Distemper/Parvo, Rabies and Bordetella (Kennel Cough) immunizations. Make it FIVE in a Row! 2018 Best of the Area!